Bruno is a male French Bulldog born on 6/24/10. Bruno has a “smooshy” face, no tail, bat ears, and a “tuxedo” coat (brindle with a white patch on the front of the chest). Yes! I have a pesky sister named Pearl. She is also a French Bulldog and is only 10 weeks old. My mommy volunteers with the Chicago French Bulldog Rescue, and helped rescue Pearl’s mom from a puppy mill. She gets into EVERYTHING and steals my toys. She’s fun to play with for a while, until I’m winded and panting, which doest take much since I have a smooshy face. My mommy has a long way to go before she’s as well behaved as me! I first lived with a great French Bulldog breeder family in Lansing, MI…the Barcs! Funny that their last name is Barc right? I was one of two puppies born to their Blanche and I was originally suppose to go live with my daddy’s family and be a show dog, while my sister Bonnie was going to stay with the Bracs and also have a show career. Last minute my original family decided to make a move to Arizona and thought that taking on a puppy would be too much at the moment. The Bracs put my cute photo on their website and my mommy found me! She already had a deposit in with the Bracs and was waiting on the puppy in November, but instead I came home in September on her birthday weekend. She constantly tells me what I was the best birthday present she’s ever received! No jobs yet. I’m only a year old! But my mom and I would probably like to do some pet therapy work once I get my Good Canine Citizen Certification. My hobbies include antler chewing (they are better than rawhides and bones! ), batting mini tennis balls around, napping, going on short walks, and cuddling with my parents. Either my elk antler or mini tennis balls. Freeze dried beef liver or anything my mom is eating. I mostly nap. I get penned off in the kitchen since the few times I’ve been trusted to roam free I sorta let temptation get the best of me – oops! So I have the kitchen to myself with my bed and some toys. Oh, and now my sister is crated in there with me so sometimes we taunt each other through her crate bars. 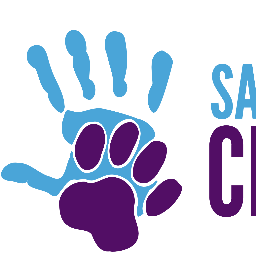 I’m really excited to start volunteering with Safe Humane Chicago! I love people and animals and hope that my presence can help educate others on how awesome pups like me can be with proper patience, love, care, and training.